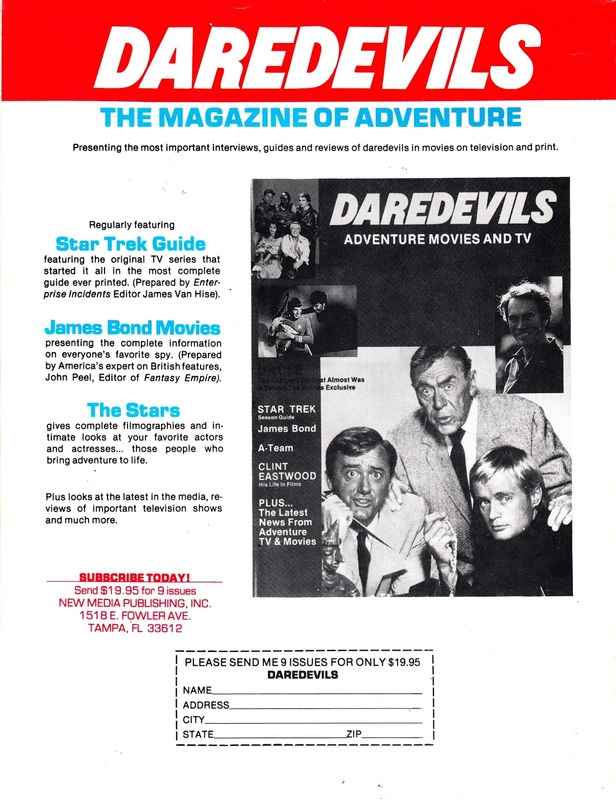 From November 1984: A House Ad for US publisher NMP's DAREDEVILS magazine, dedicated to action/ adventure film and TV. Not to be confused with the Marvel UK monthly (or, indeed, Horn Head himself), this was stablemate to titles like ENTERPRISE INCIDENTS, FANTASY EMPIRE, SFTV and a zillion of those FILE MAGAZINES dedicated to almost any TV show or comic that the publishers thought would sell. I covered THE V FILES here. I've never seen, much less read, a copy of this one but it sounds like the sort of thing I would enjoy. A swift Google search reveals no information online so there's not much else I can say. Anyone else know more... or have copies? I have some copies of SFTV that I've picked-up over the years. It's not really a great magazine but its coverage of BATTLESTAR and V make it of interest. Some of the V material certainly makes its way into the Files Series. I will have to get around to scanning some of the covers sometime.